After great anticipation and many requests, GamiWorks is now making bracelets! These new dainty glass tile bracelets are gorgeous, so reflective in the light and just perfectly sized to be worn everywhere. They are difficult to photograph and look even prettier in person. This new line of GamiGlass jewelry features individually handcrafted mini glass tiles with my Japanese chiyogami papers and superior quality silver links. 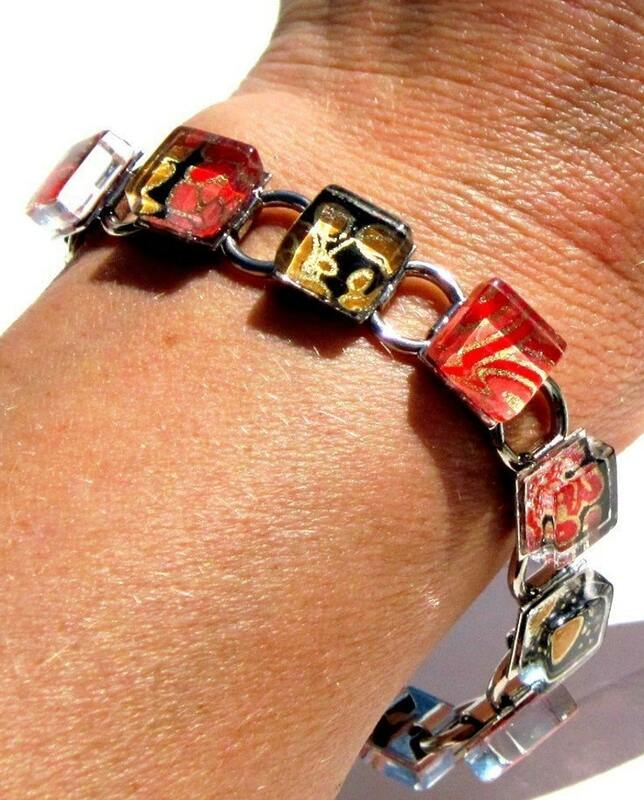 Each bracelet measures 7 1/2" long with a very sturdy fold-over end clasp. Need it shorter? No problem, just mention your preferred length when checking out. Of course, like all GamiGifts, they come beautifully packaged and ready for gifting in a coordinating gift tin. Please note...every item is a one-of-a-kind and designs may vary slightly due to the pattern of the paper. They are sealed well to be water, oil and stain resistant, but are not waterproof. Remove before swimming or showering is recommended.